In this moment of tragedy for Kenya and for the free World, we wish to share some personal feelings. Our family is an intricate part of Campi ya Kanzi. We feel comfortable in talking about love and feelings, while so much sorrow has been brought to many of us in Kenya. Lucrezia, now 11, has just started to go to a weekly boarding school in Nairobi. This letter is what she brought home last weekend. 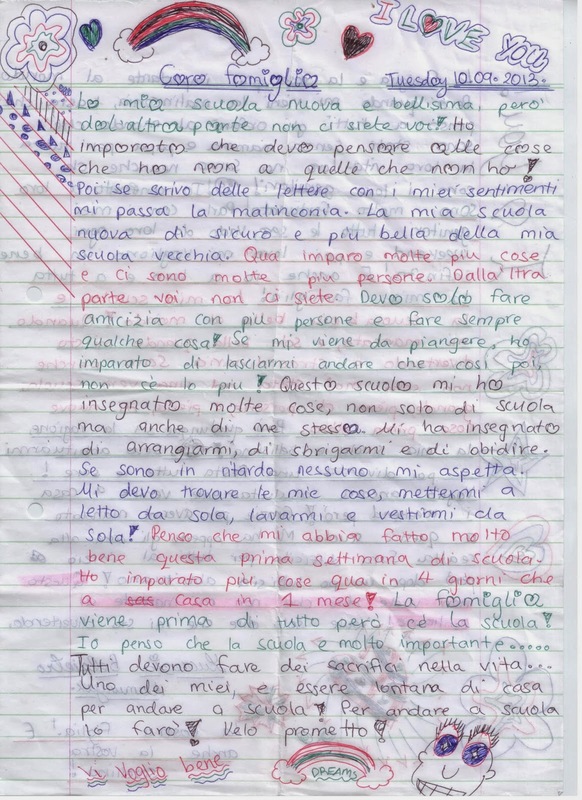 She said she wrote it in Italian (she normally writes in English) as she was thinking of her family. my new schools is wonderful, but you are not there! I have learnt that I have to think about what I have, not what I have not! Then if I write expressing my feelings, my melancholy goes away. My new school is certainly nicer than my old one. Here I learn more and there are many pupils. But you are not there. I just have to befriend more people and always do something. If I feel like crying, I have learnt to just do it, so I it will pass. This school has taught me many things, not just school stuff, but also about myself. It taught me to be more independent, faster, and more obedient. If I am late, nobody waits for me. I have to arrange my things by myself, put myself in bed, wash myself and dress by myself! I think this first week was really good for me. I have learnt more things here in 4 days that back at home in a month. Family comes before everything, but then there is school. I think school is very important… Everybody needs to make sacrifices in life. One of mine is to be far away from home, to go to school. To go to school I will sacrify, I promise you. Family is the most important thing in the World. When I get melancholic, I think about all the orphans of the World, who are without their mother e father, for their entire life. They might not even know who their parents are! Compare to them I am super lucky! I speak with my parents all evenings, I see them every weekend, and then they love me endlessly. And so do I, I love them and my entire family. My school is the best in the World. When I miss you I find it just nice, but when I am having fun I find it extraordinary. May be because this is my first real school, big, full of people, and full of unknown new things. So my school is really beautiful, no matter what. I just need to get used to it and it will then be a party all evenings! But I still will want to come back all weekends! Thank you for having sent me to this school. It has open my eyes into a new reality. It will be hard to begin with, but then we will all get used to it. This does not mean I will not miss you! To the contrary! It just means I will be enjoying myself. Lucrezia Belpietro Namunyuak, your daughter and also your sister!